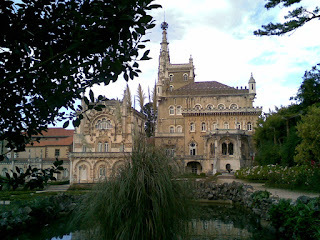 The Palace Hotel of Bussaco (Portuguese: Palácio Hotel do Buçaco), is a luxury hotel located in the mountain range of Serra do Bussaco, in the municipality of Mealhada, in central Portugal. 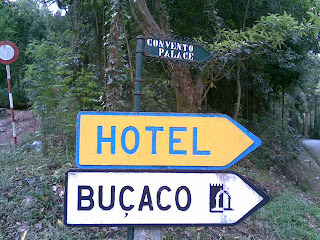 The area around the Buçaco Palace was part of a Discalced Carmelite convent established in 1628. 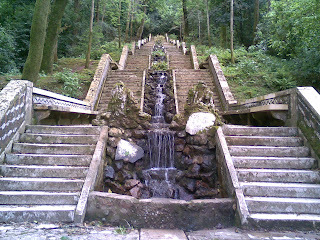 The monks not only built a convent but also created a luxurious garden with many species of trees. The garden was supposed to represent Mount Carmel (where the order was founded) and the Earthly Paradise. Date from the late 17th century a series of chapels with representations of a Via Crucis in the garden. 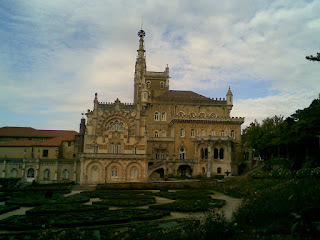 Part of the convent, including the church with Baroque altarpieces, is still preserved beside the palace. 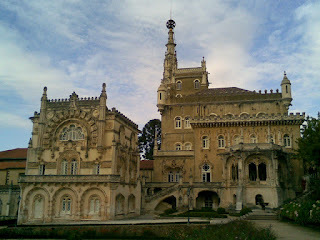 The Palace Hotel of Bussaco was built between 1888 and 1907. The first architect was the Italian Luigi Manini, who designed a Romantic palace in Neo-Manueline style, evoking the 16th-century architectural style that characterised the peak of the Portuguese Age of Discovery. The Bussaco Palace is inspired in iconic Manueline buildings like the Jerónimos Monastery and the Belém Tower, both located in Lisbon. A Batalha do Buçaco (ou Bussaco, de acordo com a grafia antiga), foi uma batalha travada durante a Guerra Peninsular, próxima do Luso, na Mealhada, a 27 de Setembro de 1810, combatendo por um lado forças coligados portuguesas e britânicas, sob o comando de Arthur Wellesley, primeiro Duque de Wellington, e por outro as forças francesas lideradas pelo marechal André Massena.